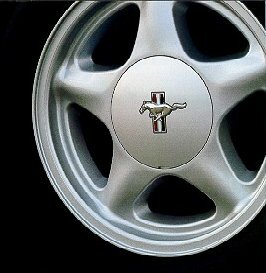 You certainly don't have to be a proffesional driver or performance enthusiast to enjoy Mustang GT. The only prerequisite is an appreciation for the fun of driving. One look at the ground effects styling tells you this car was not designed with basic transportation in mind. 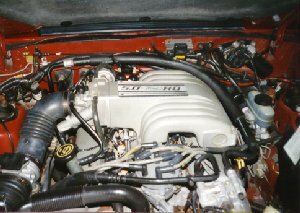 The 5.0L HO engine is among the most powerful production engines in America, generating 225 horsepower and 300lb. ft. of torque. These are reasurring numbers indeed for situations like passing when extra power translates into extra confidence. And GT is equipped to handle the most tortous pavement with a wide, agressive stance, 16-inch cast aluminium wheels, 55ZR performance tires and a performance suspension wich includes Ford's quadra-shock setup in the rear and a progressive-rate spring at each corner. 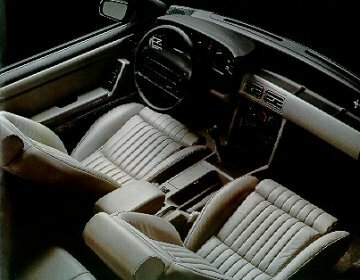 With this kind of performance hardware, you would expect to find an interior equipped with comfortable, multiadjustable articulated front bucket seats. 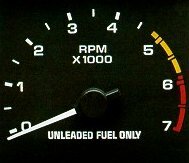 Full instrumentation with "user friendly" analog gauges. A 7,000 rpm tachometer for more efficent shifts with the 5-speed. They're all there. You also get safty equipment like an airbag. You also get the stereo/radio and a rear window deforster as standard equipment. You can choose to add the equalizer, an airroofor choose between some of the many wheel covers. After more than a quarter century, Mustang GT offers few suprises. You get a contemporary, bold look. Legendary spirit. And a large order of motoring fun.